Born in Lezhe (Albania), 10th of august 1968, in a family of singers and traditional musicians. He took his first steps as a musician at the age of 5 years on the çifteli (lute with two chords). Later, he studied clarinet, horn and accordion. Has Belgian/Albanian nationality. 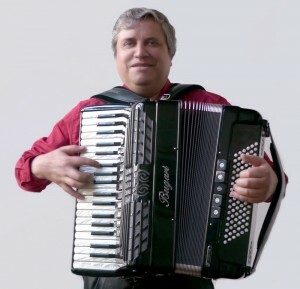 Owner of the 1st price for accordion at the conservatories of Tirana and Brussels. He plays many albanian instruments, such as Lahuta, çifteli… and rhapsodes many traditional lyrics. His music and his singing are rooted in balkan traditions. At the same time, he also masters a huge repertoire of popular and classical music. He performs as a solo artist or with the accompany of other musicians. 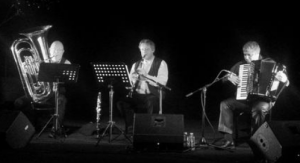 “Lule bore Quartet”, for example, one of Gjovalins formations, was chosen by the RTBF emission “Le monde est un village” as one of the 5 best music groups (2004). Gjovalin also won the 2nd price for traditional a capella chant – Trévise (1995). He is the founder of the project “Tirana-Brussels” “festival Balkan-Trafic” – Beaux-Arts – Brussels (2008). Since 2013, Gjovalin shares his experience with the Balkan Nonaj group. 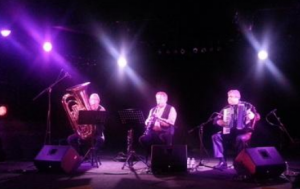 The trio is composed of Gjovalin Nonaj, accordionist, composer and arranger, Christian Debauve, clarinettist, professor at the Brussels Conservatory, and Didier Heggerick, tuba soloist with the Royal Band of the Guides. “Nonaj Balkan” occurred Musiq’3 Festival – RTBF at “Marni Theatre” in 2014. For more information, see curriculum vitae de Gjovalin Nonaj. 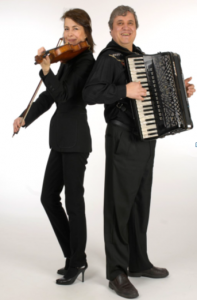 Mr. Gjovalin Nonaj and Mrs. Lucia Barcari are without a doubt not a traditional musical duo. Through their blending of violin and accordion, performing both classical and folk music, they create a unique auditory experience. The duo presents a delightful program full of transitions between playful lightness, dynamic intensity and gentler tunes. Both of these artists have already received considerable acclaim on their own, and international audiences are not new to either of them. Mr. Nonaj has not only played with various ensembles, orchestras and solo, but also contributed to events such as Balkan Trafic Festival. Mrs. Barcari has given solo concerts in Germany, Finland, Ukraine, Belgium and Canada, in addition to busy orchestral and teaching schedule. Combining their individual extraordinary talent, the duo performs a diverse blend of compositions. Their body of arrangements, which might well be one of a kind among contemporary instrumental ensembles, earned them standing ovations from their audience.